- A perforated board with 100 holes in rows of 10 arranged in a square. At the left side of the board is a window with a slot for the insertion of the cards. - A red, wooden disc. Show the child how to slide the card (4) into the slot on the side of the board. Place the little red disc above the 1 at the top of the board. Say, “This tells us we need to take 4 one times. Using the red beads, place 4 one times in a vertical line. Have the child count how many beads there are on the board. Tell the child, “4 x 1 is 4” Have the child write the answer on the paper next to the equation. Move the disc over above the 2. 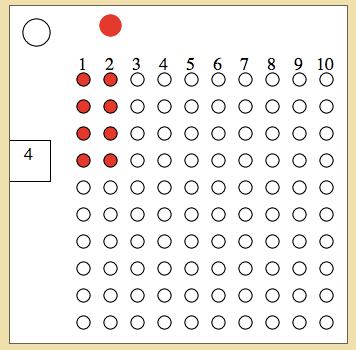 Have the child place the red beads in a vertical line next to the first four. Have the child count the total number of beads on the board. Say, “4 x 2 is 8”. Repeat in this manner. When the child reaches 4 x 4, have him say the equation with you. If the child is making the table with ease, when he reaches 4 x 8 show him that 4 x 7 was 28. Count from 28 up four more. Repeat in this way until he has finished the board. Have the child read all of the equations and answers written on the piece of paper. The child can check his work on Multiplication Chart 1. The child, over time, does each of the tables in the same way. He can then make a booklet of the tables. To give practice in multiplication leading to the memorization of the essential multiplication tables. The child checks his work with Chart 1.